It’s only been 3 months since we last checked in with animator extraordinaire Joseph Wallace for his cut-out characters project Natural Disaster, but never one to rest on his laurels, Joseph’s back with Edith Piaf (Said It Better Than Me), an enchanting stop motion puppet music video for Sparks. Always happy to tap into his creative process, I spoke to Joseph about bringing Ron and Russell’s 1930s styled Parisian adventure to surreal life over a breakneck paced six week production period. Welcome back, it’s not been that long since we spoke to you about Natural Disaster. When moving between projects (especially overlapping ones) does the momentum from one fuel the next or is there a process of decompression you need to go through in order to clear your mind and focus on the task at hand? Thanks for having me back! Well, actually things are a little out of sync as Natural Disaster was made in 2014 but due to various other commitments, wasn’t released online until a few months ago. I’d love more time to decompress but the truth is everything overlaps and is running parallel but I do try to work things so I can disappear into the zone required for animating without being distracted by other projects too much. There are definitely creative parallels between projects and between mediums which I always find inspiring and certain methodologies feed into each other. Often there are certain pieces bubbling away, usually more independent personal projects, that you’re waiting for a green light or a pot of money or a period of time where you can make something and sometimes there are projects that come up out of the blue and are executed incredibly quickly, like this music video. You’ve mentioned that Sparks afforded you great deal of freedom with this project, how did not being tied to a literal translation of the lyrics open up the narrative possibilities of the video? Did you manage to sneak any personal references from your time in Paris in there? Ron and Russell Mael, the brothers behind Sparks were incredibly generous creatively and really gave me carte blanche after talking about my interpretation of the song and my ideas. The brief was quite open and my concept came from a certain sentiment and feeling that I took away from listening to the song. I didn’t want to literally illustrate the lyrics as you say, I was keen to create a visual metaphor to articulate the notion of a ‘life not lived’ which is where the exotic, colourful bird came from. I liked the juxtaposition of a very monochrome, almost seedy 1930s Paris with this striking, vibrant bird. In the original pitch I had just one character chasing the bird so the metaphor was perhaps more concise, then after the first conversation with Ron and Russell they asked whether it could be the two of them in pursuit. Having got to know more about the band whilst researching for the piece, it makes of lot of sense; the brothers appear in all of their past videos, both live-action and animation. So it went from two puppets to three, and actually in the end, five puppets, as there were duplicates of Ron & Russell. So I have them to blame for the lack of sleep! I liked the juxtaposition of a very monochrome, almost seedy 1930s Paris with this striking, vibrant bird. Once I had the elements of the bird, the brothers and Paris in place I just sat, listened to the track, drew and conceived the detail of the visual narrative. It was all fairly organic, picking up on little references in the lyrics and thinking about a surreal journey for the characters to go on, and about images that were exciting to make and that would be striking for viewers. 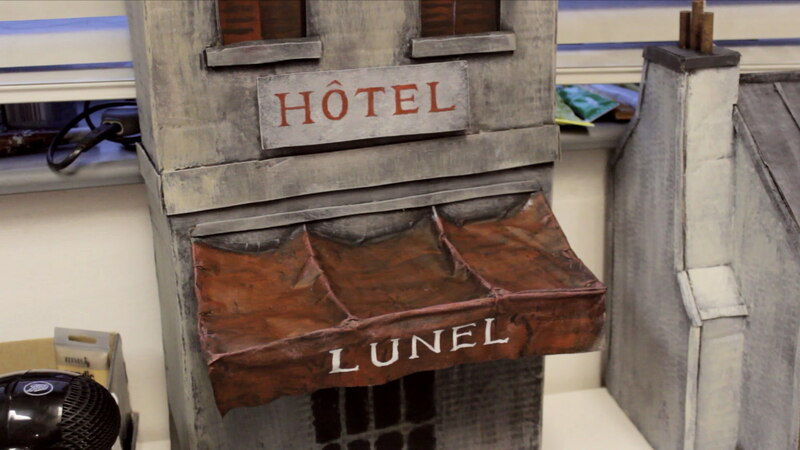 There is a small reference to my personal connection to France – the hotel that Ron and Russell run past towards the start of the video is called ‘Hôtel Lunel’. Lunel was the name of the town I used to live in, just outside of Montpellier, when I was out there with our old film collective. 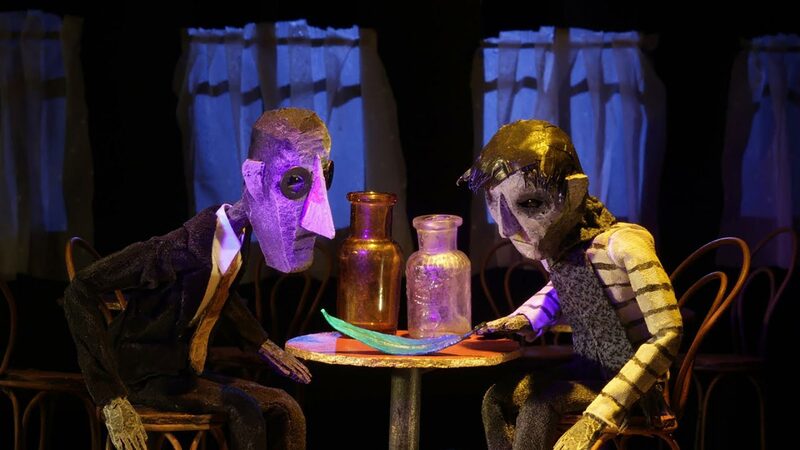 The puppet versions of Ron and Russell have a distinctly angular, sculptural look, could you tell us more about the design and creation process behind them? After the decision to include the brothers in the video, I set about making maquettes to show how I would depict them in my style. I started by making sculpts in clay which was a good exercise to get a feel for their facial structures and features but in the end I just wasn’t happy with how they turned out. I think I was trying too hard to make them look like the band and they ended up too naturalistic. Through material experiments for my new short I’d been playing with carving wine corks and really enjoyed the quality and texture they have, so I made two new maquettes in about two or three hours which were much more successful and felt more aligned with how I wanted it all to feel aesthetically. There was something in the act of carving that dictated I couldn’t be too detailed so they became much more sculptural. I tried to capture the essence of, not just their appearance, but also their character as obviously the faces don’t have different expressions, they operate like wooden marionettes or Eastern European animated puppets where everything is expressed through gesture and physicality. I love the twilight neon lighting which suffuses this world, how did you go about establishing the correct tone for the brother’s Parisian adventure? I’ve lived and studied and worked in France over the years and have spent a lot of time in Paris so it’s a city I know very well. So I have a lot of memories and images of the city, and I love how you can walk through the streets and it’s very easy to imagine how it looked and felt a hundred years ago, especially in areas like Montmartre and Montparnasse which is mentioned in the song. I gathered a lot of visual reference for myself and the model making team and, when designing, I really tried to find iconic elements that would help geographically place viewers without it being a picture-postcard, tourist’s Paris. Obviously there’s the Eiffel Tower in there towards the end but in general I wanted it to be mostly cobbled back streets and theatres and cafés that would only be found off the beaten track. The neon element really came from experiments that Péter Vácz and I had done on his music video Dear John for James which was through the same record label in fact. Péter had got all these neon paints and we used them on the puppets, and I just loved the quality of the colour and it felt very fresh to have that kind of psychedelic palette in this kind of puppet animation. So I took all of that and tried to push it in a different way in Piaf, so the neon is seeded in the aesthetic throughout with the signs that Russell walks past, but then also in the feather and eventually with the bird. The whole production was turned around in a just six weeks, in what ways did that timeframe impact the production process, techniques and your use of collaborators on the film? I guess the main impact was working incredibly hard, without pause, doing crazy hours for the whole production! Actually initially there were more simplified elements but when the model makers started creating these beautiful Parisian buildings I really wanted to do them justice and so things kind of expanded having a team realising stuff around me. I had Dutch puppet maker Roos Mattaar who made the puppets with me and Aidan Whittam did model making and then they both animated with me. Then there were a few other model makers for a week in the middle but it was mostly just Roos and I full time, so a very small team. It’s really about elevating very humble materials into a cinematic realm through design, performance, lighting and camera. Despite the tight schedule, I was really keen to push the cinematography in this piece and I wanted to bring in camera techniques I’d developed working in live action. I was lucky to have some really generous people lend equipment for the piece, including Simon Tytherleigh who lent me a huge home-made motion control rig which meant I could realise all of these sweeping physical camera moves which I just love in stop motion. I wanted the whole thing to feel cinematic and have as high production values as possible and, at the same time, I always want the audience to be reminded of what it’s all made from and the materiality of puppet animation. So it’s really about elevating very humble materials into a cinematic realm through design, performance, lighting and camera. That was something the brothers picked up on when they came to visit my studio to shoot the behind the scenes film, they were amazed by the ‘illusion’ of it all, that cardboard and wine corks can be so evocative and transport viewers to this other world. I think working incredibly quickly can be really satisfying as I don’t have a huge amount of time between the imagined film in my head and the actuality of seeing it on a screen. There’s no time to overthink or second guess myself so it tends to be a fairly instinctive process. I can’t get lost, it’s just one foot in front of the other, running towards this image in my head until the whole thing is finished. That often leads to me feeling more satisfied with the outcomes of shorter projects because the distance between concept and completion is so minimal. Where will you be taking us to next? That’s a good question. It depends what gets funded first! I have three films I’m really excited about which are in various stages of development at the moment. Sadly funding for animation in the UK is pretty dire, I’m hoping that will change in the future and I’ve recently joined the Animation Alliance’s advocacy board to try and lobby for more support for independent animation. But the lack of support here has led me further afield, my producer and I were in Czech Republic at the start of the summer where we won the pitching competition at Visegrad Animation Forum for my new short Salvation Has No Name. For the moment I’m doing some talks and workshops, I’m hosting the Desert Island Flicks session with OSCAR winning animator Michael Dudok De Wit at Encounters Festival and then Péter Vácz and I will be running an intensive week-long course in stop-motion animation at Primanima festival in Budapest next month. Hopefully one of the new films will kick into production soon as I’m really keen to make something longer and more narrative with an immersive world and a similarly sculptural visual language.